When used for the entryway without any embellishment, marble flooring is intrinsically elegant and can make the expansive floor of your luxurious home look stunning. It is also possible to customize the floor of your entry way with intricate designs that are complemented using beautiful hues of natural marble. One of the best choices for your entryway is a marble floor design made from calacatta slabs. You can order custom sizes for your high end home. You can choose the marble patterns and colors and the design will be install to your specifications. calacatta marble floor designs can also be enhanced with square, circular or oval borders of a complementary marble. Alternatively you can use Bianco Carrara mosaic medallions. These offer more choices because they are composed of tiny marbles that can be easily fixed into curves and delicate patterns. The medallions are available in one piece and in a wide range of sizes and colors. They are produced ready to fix in a particular space of your luxurious home and do not need anything more than grouting in order to be complete. Another great option for the entryway of your luxury home is Bianco Calacatta marble flooring rugs. You can choose between square or rectangular shaped inlaid Bianco Calacatta marbles that are available in ready to install sections. One good thing about this option is that you can choose the colors and designs. Mosaic floor designs have a close resemblance to wool or other textile rugs and offer more choices compared to traditional stone rugs that are primarily geometric. After choosing a floor design for your custom built home, you can have it sculptured in custom color and the right scale to fit the area where they are supposed to be installed. 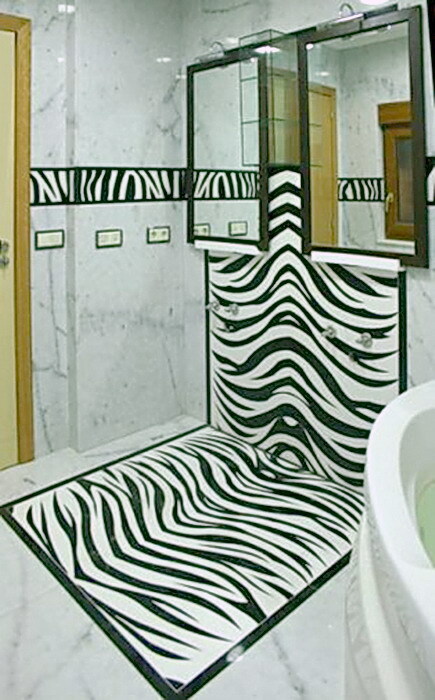 Custom floor designs can include anything that you want to make the desired impression. They offer color and a stylish finish to the entry without adding clutter or taking floor space. If you like you can have the floor design in satin finish. This will not just elegance to your home but also ensures that you get a long lasting entryway. Therefore, when it comes to adding personalized touches to your home’s entryway, the options are endless. Your creative mind should allow you to get a unique entryway. To learn more about marble floor designs and their transformative nature in the home, visit Marvelous Marble Design Inc.
Posted 4 years, 9 months ago at 11:48 pm.